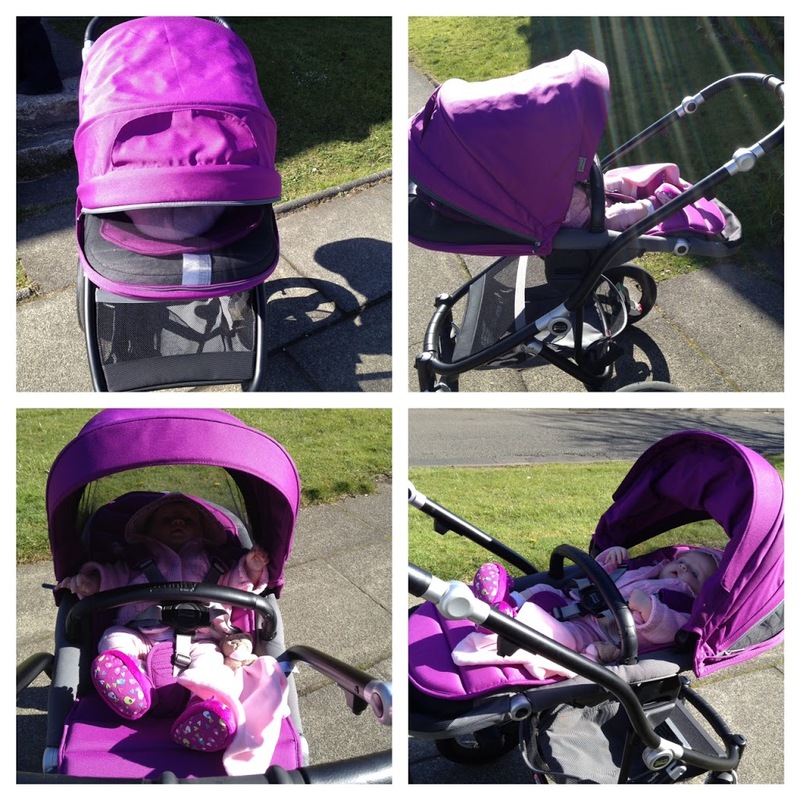 I have an excellent car seat for Aria which is the Britax Baby Safe car seat. As Aria is getting bigger the car seat is getting heavier and it’s getting harder to carry her in this for the school run to pick Lucas up from school and then to get Tyler from nursery which has a whopping 26 stairs for me to walk up. Yes I’ve counted. Lucky for me the Britax Affinity allows me to clip the car seat direct in. Clunk and Go adaptors are awesome. 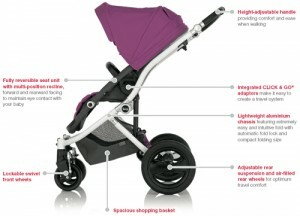 I was sent one to review as part of the Britax Mumbassador scheme. It’s so easy to use. 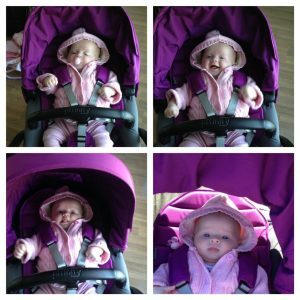 We have the Isofix base with the car seat so I just click the button to lift the car seat out. The frame is so easy to put up, it’s a one handed unhook of the clip and it opens. The car seat clicks into the sides and away we go. Super easy for on the go school runs, quick shopping trips, anything that is just a short journey. I have the cool berry colour pack which looks great and bright. It’s an unusual colour. There is a newborn insert which can be added in to help keep a newborn straight and secure, Aria is a little older now so she doesn’t need to use it I feel. There are many different colour packs to chose from, so you can select one which suits your needs. The frames also come in different colours too. I have the black frame which I think looks great. 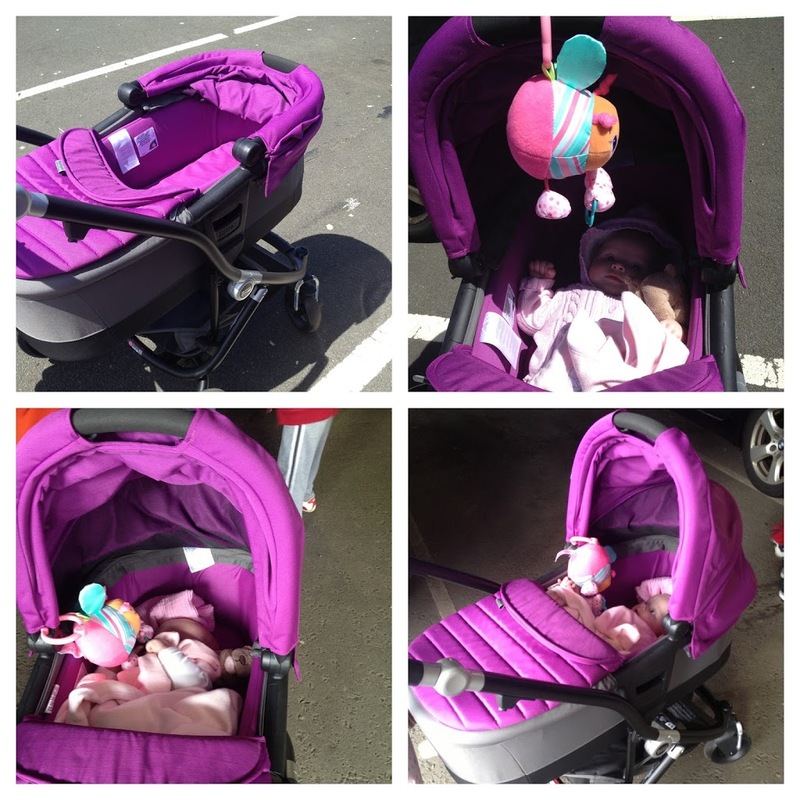 I have used the carry-cot for Aria and it is really good, the fact she is enclosed in and can lie down flat. It’s very comfortable looking too. Perfect of a newborn up until they can start to sit up. The Britax Affinity is easy to manoeuvre about and goes up and down kerbs, it is also no trouble for the uneven paths we have. The only issue I have is that it’s inflatable wheels, however I’ve used it for a few weeks now without any issues. I’ve had problems in the past with pushchairs and flat tyres, but it doesn’t seem I will have the same with this one. They seem sturdy and well made. The suspension is adjustable and the air filled tyres are designed for comfort. The handle is height adjustable for comfort for person pushing. 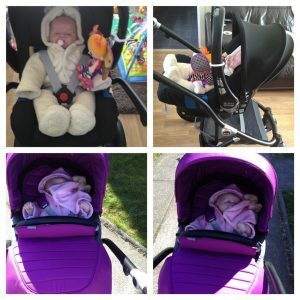 The pushchair part can be rear facing or front facing. I love the fact it can face the parent as it’s much better from an early age when your little one can see you. It is fully reclines for when they are young you can have it lying right back or when they are sleeping. Then when your baby is wanting to see you can tilt it forward a bit, it’s really easy to do. There is also a zip in the hood so you can let some air in through the netting on a hot day and the hood comes right over protecting your little one from the sun. The Britax Affinity pushchair has a five point safety harness and adjustable shoulder straps for the ultimate comfort and safety. You can see how much Aria like to travel in this one. The Britax Affinity is the only buggy with its own anti-theft protection in place. Each pushchair has it’s own identity number which is registered, similar to the Vin number on a car. You can read more about it here, when I blogged all about this feature. All in all it’s an enjoyable and excellent as a travel system, but equally as good on it’s own. It comes with a spacious shopping basket below and a rain cover to protect them from the lovely Summer rain we have. I’ve found this really easy to use and very quick to change from one system to another.